Hurry on over to the Oscar Mayer Facebook Page. 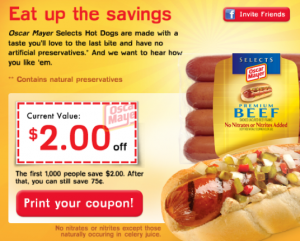 They have a $2/1 Oscar Mayer Hot Dog Coupon available to the first 1,000 people that print. If you are not one of the first 1,000, you will still have the opportunity to print a $0.75/1 coupon.